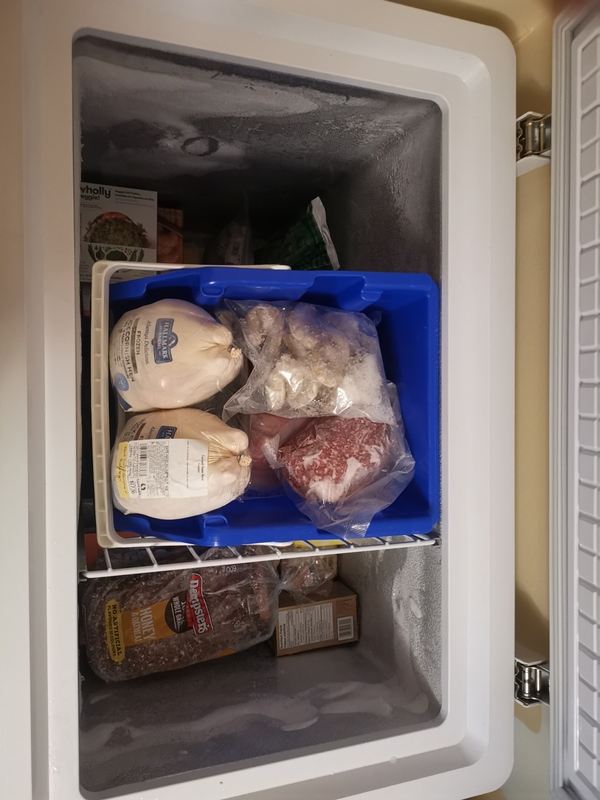 I finally, really, got around to organizing the deep freezer. Now about a month or so ago I had my Aunt stop by. I gave her about half of the contents out of the deep freezer. Most of it was meat that would get beyond eating before we got around to it. There was also quite a bit that would be better for the dogs. However, with Galaxy’s allergies I could not give it her. I in turn also dealt with the freezer. 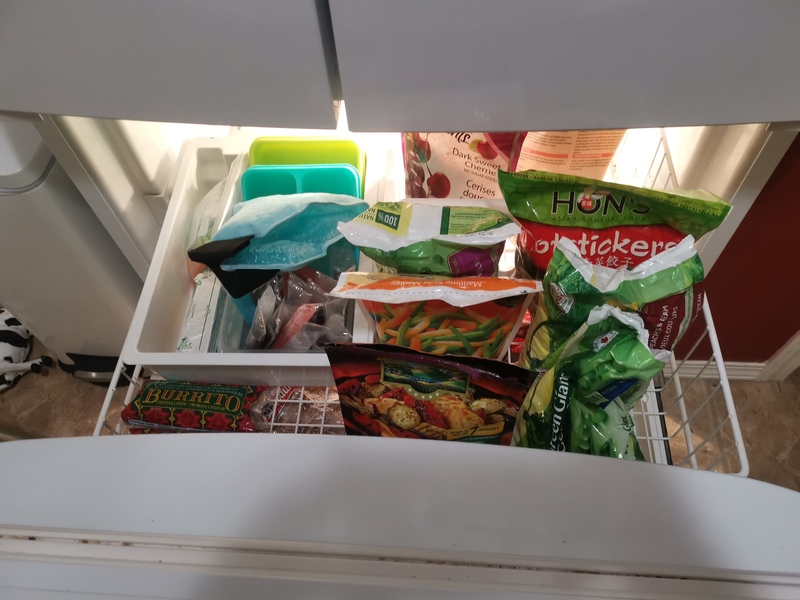 First photo is of the freezer. It is not bad but you can see there are things in there that should truly be in the deep freezer. The lamb roast, cornish hens, and even shrimp do not belong here. 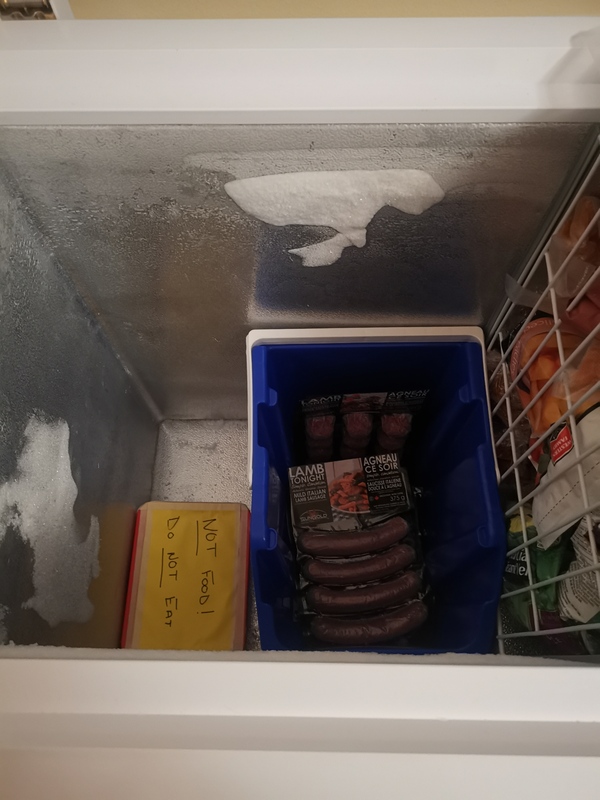 The second photo is of the deep freezer. This does not look like it was ever emptied. Things like the fruit and veggies do not belong in here. I also cannot find anything. Even if I wanted to cook a protein it would be impossible to find. I bought two stack-able blue bins with handles from a local chain store. I think there were $10CAD each. I took the dimensions and looked online before choosing. I had chosen two different bins. I looked through the store and could not find the other one that was suppose to be in stock. I think these were the better choice anyways. 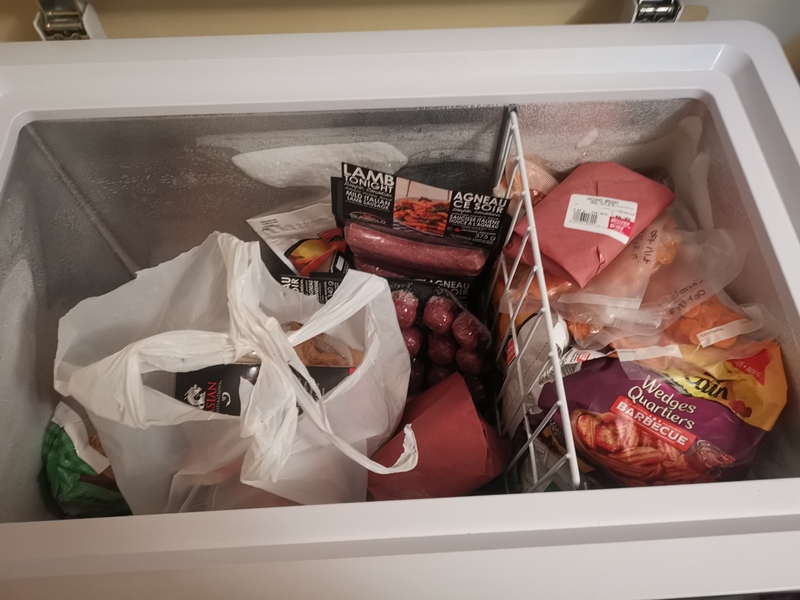 This bottom bin I have put all of the lamb into (minus the roast as I had not done the freezer yet). There is ground, sausage, meatball, and roast lamb all in there. Now the reason there is so much lamb. Missy needs to be use to the protein before we go to visit her family in China. This will common for us to eat in the area we are going and I do not want her possibly getting sick while we are there. The top blue bin contains all other proteins. The only thing that is not actually in there is pork. I do not like the taste what so ever. I am not a bacon eater (I use it in cream soups only because I cannot get that salt ratio right with out it). I think there is a bit of ham in the pizza slices pack and I do have pancetta somewhere in the mess as well. I tend to use pancetta over bacon. One the left hand side I have boxed items stacked. Such as veggie burgers, breaded chicken, and I have a loaf of garlic bread behind that. On the right hand side I have more butter than I know what to do with! There is a bison pie in there too from a local producer and I have since added some quick breakfast options. On to the freezer! All of the vegetables have been added here. In the back there are a couple bags of fruit. Most of which came out of the deep freezer. The bottom left hand side is some proteins. Breakfast sausage, bread chicken fries, and I found the pancetta. 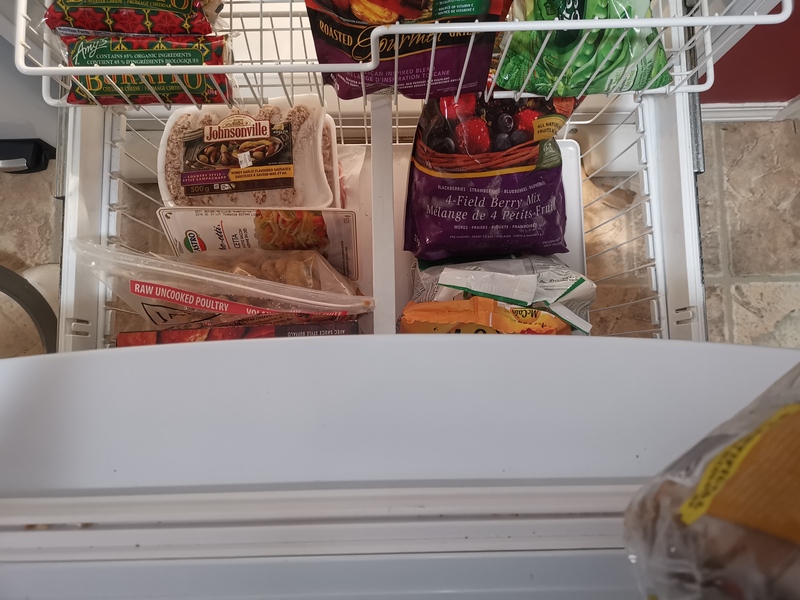 On the right hand side I have a huge bag of mixed berries that would not fit up top. There are potato wedges and veggie tots(?). It mostly is stuff that I need to use up sooner than later or one off purchases. Stuff that I will forget about if it is not in here. While I did this, I took a full inventory. This should help me figure out what to cook (it has not done that yet ha-ha) and help when shopping. 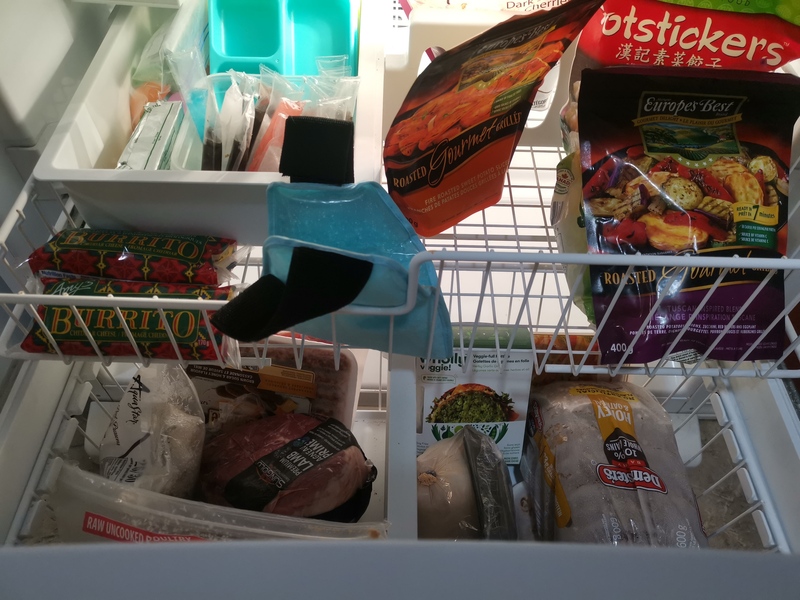 I hate when things go bad in the freezer. I also hate being in the freezer aisle, seeing things at a good deal, and not knowing what I already have. So far the system has worked out for me. I do need to really get use to using the inventory system for everything. I do not think I will be changing anything soon. I do need to inventory my pantry though with the expire dates.